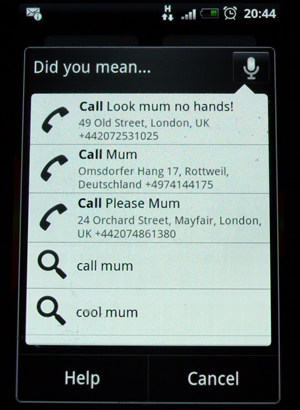 Tonight I decided to try using Google Voice Search to call my Mum. Now I have had this app on my phone for a long time and have only previously used it from within other applications such as browsing the internet or compiling text messages by speaking them. It was only after an update that I discovered that it can also be used to almost fully control your phone by voice commands. Listen to a song, get directions, go to a website and allegedly call a contact. Well it was a FAIL, I launched the app and said “Call Mum” now I had a phone 10 years ago that could do this without mistake but my HTC Desire was not going to oblige. It didn’t call my mum, it returned a list of “Mums” that were clearly not my mum! Not juts numbers either, there addresses too. I don’t have these other mums in my phone book where did they come from? After having to resort to locating my mum in the conventional way by manually dialing her number she suggested I try asking my phone to call my sister and my dad. Guess what I discovered I have sisters I didn’t know about and a rich dad in America. If you want the app then this is the official link. Sorry there are no comments, be the first to leave a comment.